It does not seem that long ago that we were at The Golden Fleece on Mansfield Road trying out one of their Chicken Sandwiches, when it was a case of “Argonauts need not apply, Cajun Sandwich lovers are welcome”. 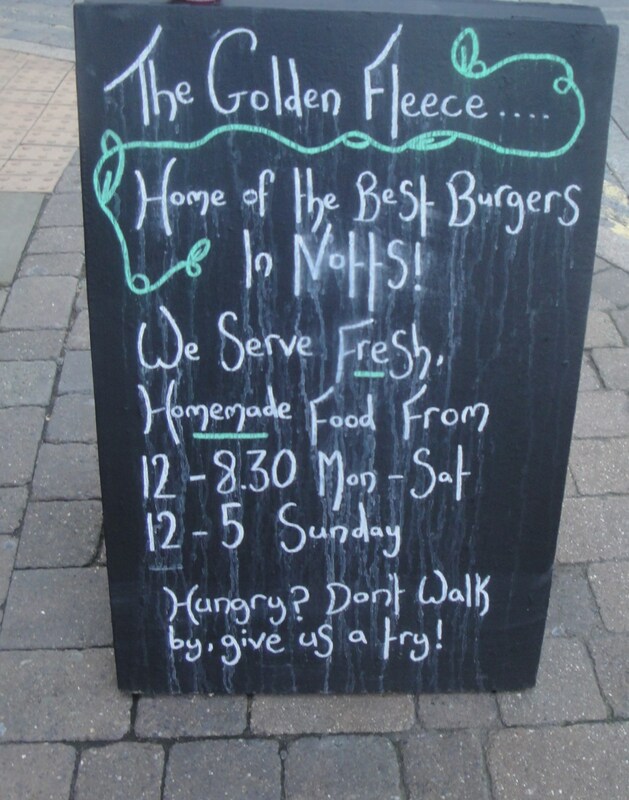 This past Friday we were walking back down Mansfield road and saw their chalkboard outside proclaiming that they were the “Home of the Best Burgers in Notts!”. 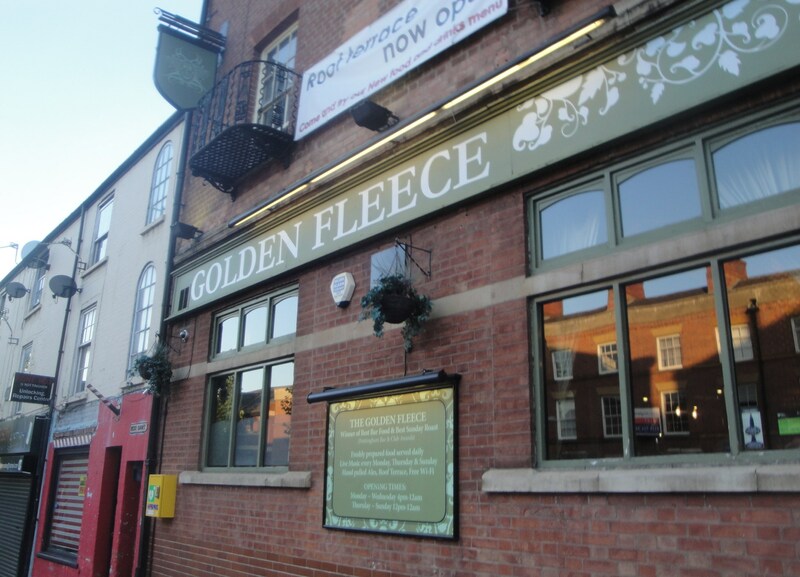 We were in that kind of mood that we had to take up the challenge to enter the Fleece and get a burger just to find out it that was a fair claim. Lets get straight down to it then! We both ordered the “Fleece House Burger” which was a ‘Beef Burger topped with bacon, caramalised onion, gherkin, smoked cheddar’, all housed in a wholemeal bun. 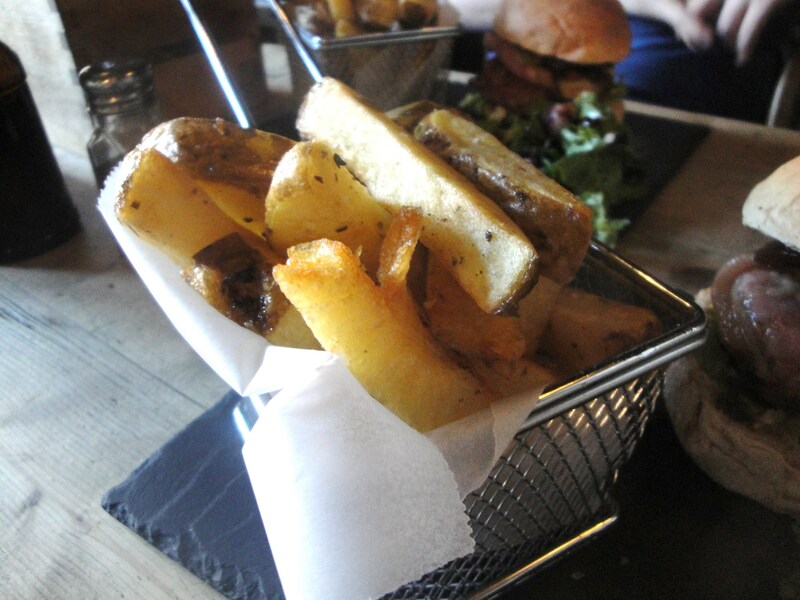 It comes with a little dressed salad of herb green leaves, and an individual basket of home cooked chips (or wedges). 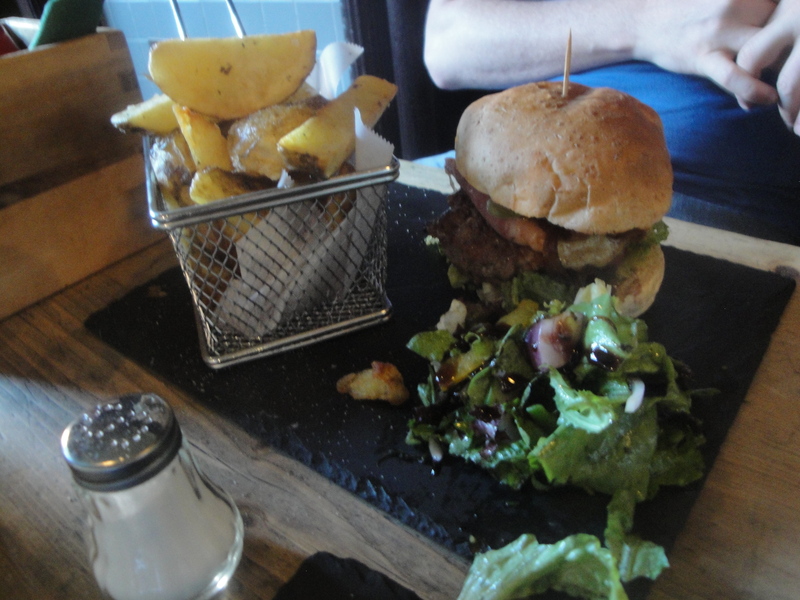 For some reason it comes on a slate plate, which is great for the aesthetics of the dish, but was totally hopeless after the first bite when all the lovely burger juice oozed out of the sandwich on to the slate and then ran across the flat surface towards the table. Luckily I saw that coming and had started to build a small dam of chips to hold the juices back into a dipping reservoir. I am going to have to concur that the claim to have the best burgers in town may well have some sound foundations. The meat patty was thick and juicy, well seasoned and well complimented by its fellow bedfellows in the bun. 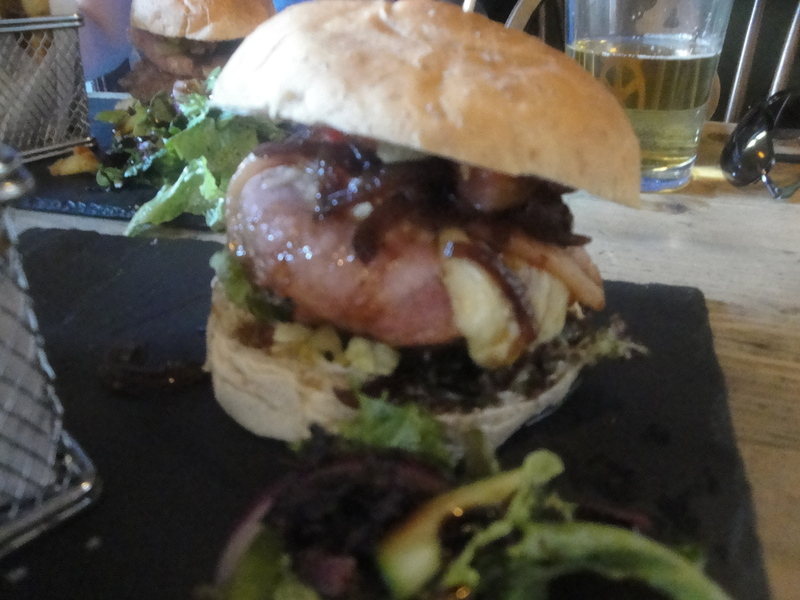 The bacon was plentiful, the smoked cheese added some sweetness, as did that caramalised onion. I was even willing to accept that the gherkin had a role to play at the burger party that was beginning to get started in my mouth. You start to realise that something slightly magical might have just happened when you are even enjoying eating the bits of sandwich that don’t have any meat in them, that was largely due to the fact that the bread had absorbed a whole lot of the lovely meat juices from the burger. The chips are really good also, these could well be some of the best pub chips I have eaten around the city. I think that there might have been an even bigger portion since my last visit and I do like the way that they are served in those little wire baskets. You Know I have not eaten every burger in the city (well not yet anyway) but I think that I can see why they say they have the best burger in the city on that chalk board outside. It really is a burger worth walking up Mansfield Road from the Market Square for. You could get one of the many buses that run up the hill if you wanted, but based on the size of the plate that you will receive when you get there I would recommend burning off a few calories on the way up, you can free wheel back down the hill afterwards anyway. I am not sure why I felt the need to take a picture of the Burger section of the menu, probably so that I would remember the details the next day. 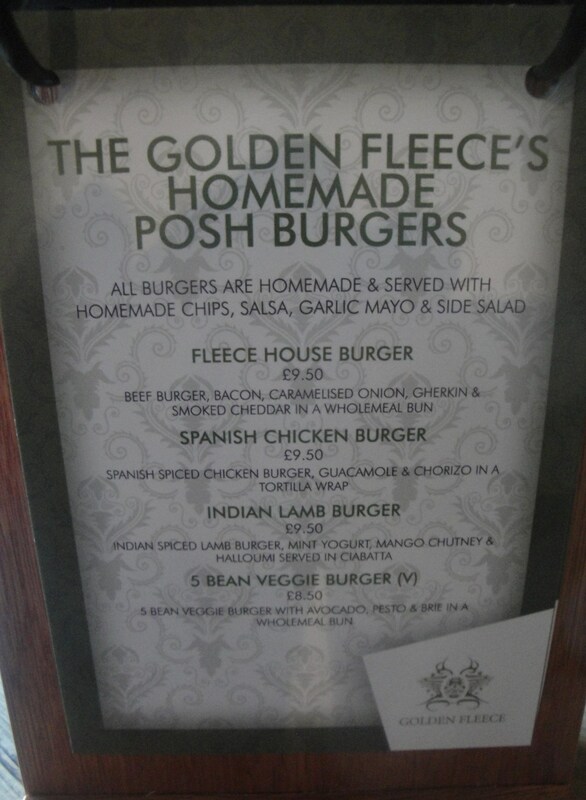 For the record although we both decided fairly quickly that we were getting the Fleece House Burger, there was a tiny amount of debate on getting that Indian lamb burger, another day perhaps. It did sound quite interesting. If I do make it back up the hill to try it, well that will be my third trip to eat and you don’t get me back too many times unless it is really quite good. Food looks delicious. Thanks for the detailed post, much appreciated.